JERUSALEM (CNS) — Pope Francis’ appeal to pray for peace in Syria has a particular urgency for Catholics in the region, who say their countries are most likely to suffer the brunt of any attacks on Damascus. In Bethlehem, West Bank, Father Marwan Di’ides said parishioners at St. Catherine Church would offer special prayers of peace during all eight Masses over the weekend of Sept. 7. He said the biggest concern for the people of Bethlehem was how the situation would affect them economically, since any talk of war in the area immediately reduced tourism, which the city’s economy largely depends on. In the Israeli coastal city of Jaffa, prayers for peace were planned during Masses Sept. 8, said Father Zaher Aboud of St. Anthony Parish. 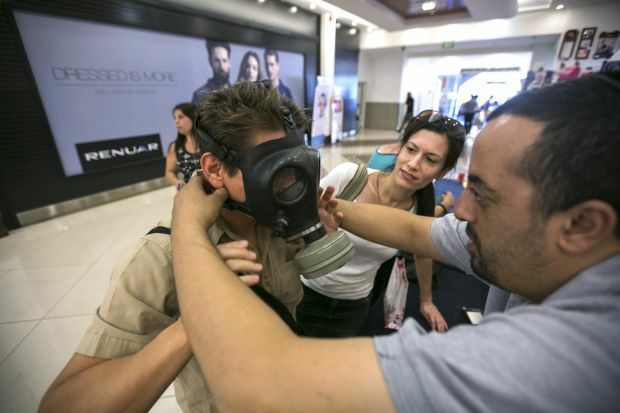 Father Zaher said that many of the parishioners had already collected their gas masks, and that a lot of the parish’s children were worried. He added that St. Anthony was also the parish for Filipino and other migrant workers, so many of his parishioners were not eligible for the gas masks distributed by the Israeli government. The Assembly of Catholic Ordinaries of the Holy Land, meanwhile, encouraged parishes to participate in the Sept. 7 prayers for peace with Pope Francis, who is scheduled to lead a vigil in St. Peter’s Square at the Vatican. “May our voices of prayers overwhelm the sounds of the war drums,” said the Mideast church leaders. In Egypt, Coptic Catholic Patriarch Ibrahim Isaac Sedrak told his community to fast and dedicate an hour to prayer for peace in Syria during Catholic Masses nationwide the evening of Sept. 7. Bishop Pelatre said he worried that any strikes on Syria would only add to the desperate refugee situation the Syrian war had already created. “We can’t even cope with the amount of refugees here already,” he said of Catholic and other humanitarian efforts to help Syrians who have fled into neighboring countries, including Turkey. On Sept. 3, the U.N. High Commissioner for Refugees announced the war in Syria had produced more than 2 million refugees. About half a million of them currently reside in Turkey. In Lebanon, which is hosting more than 600,000 refugees, the country’s Maronite Catholic bishops praised Pope Francis’ call for prayer, fasting and repentance for peace in Syria and his direct appeal to the international community for dialogue and negotiation for peace. Contributing to this story were James Martone in Istanbul and Doreen Abi Raad in Beirut.